My solitary previous excursion even predates the records I've kept on this venerable website. Back then I have a hazy memory of emerging from Charles Holden's low-slung, futurist station building to find a solitary row of tall redbrick shopfronts across a busy road. In my recollection, there were newsagents, laundrettes, a Chinese takeaway - the familiar constituents of countless similar ranges of small, local stores across the suburbs of London. I'm not sure if that was the exact mix of premises or whether I've projected the many hundreds of similar ranges of district shops I've seen since onto unlucky Cockfosters? I recall on that visit sensing something I'd later learn to call 'range anxiety' - the sense of being at the end of London was new and strange. There was too much to left to discover in the centre of the city back then, and with the line inked carefully into my Baker Rail Atlas I was soon off again, plunging back under the earth and into the city I was slowly growing to understand. I already had my secret haunts, my customs, my comfortable corners, and the chilly heights of the ridge shared by Middlesex and Hertfordshire could wait. In the event they waited about twenty years and a lot had changed at Cockfosters in the interim. The station was still the sleek, concrete-ribbed structure I remembered, nestling in a hollow beside the road like the skeleton of a prehistoric beast. It echoed the similar construction seen in the line's western terminus at Uxbridge - but it was grounded, purposeful - somehow less lofty and less deliberately architectural. Cockfosters station nestled neatly into its site, leaving a clear view across the heights. Following the rather charming 1950s vintage signage, I took the subway under the road and emerged in the pleasingly curved shelter which echoes the profile of the main station building . The red brick wall of shops loomed above me as expected - but oddly it had changed! The metal shutters of off-duty off licenses had been replaced by a capacious double-fronted café where people enjoyed equally impressive breakfast platters. A greek restaurant owner started his day by hosing down the footpath and watering hanging baskets dividing his inviting looking premises from a local whole-food market. The summery weather had brought people onto the pavement tables - expensive sportswear and jewellery hung from their tanned frames while their Porsches ticked in the heat. Cockfosters was looking east - aspiring to be the Essex suburbs over the ridge, rather than the more serious and genteel hamlets of North London. I felt out-of-place, but entirely unseen - because I didn't fit, they couldn't detect me. I ambled towards the Co-op and purchased plenty of water. It was already well over 25 degrees and getting warmer. My walk felt suddenly ambitious and the charms of this curious knot of civilisation seemed more attractive. The spattering skillets of sausage and vine-ripened tomatoes thudded satisfyingly on the table, the jug of inky black coffee was whisked away for replenishment. Summoning resolve I turned west - again, against every instinct - and approached the attractive honey coloured parish church. Chalk Lane wound around a knot of impressively large homes, and I realised I'd not understood just how suburban this area was before. I'd always written it off as some sort of aborted Metroland outpost, empty fields and aborted ambitions beyond the fringes of polite society. The provinces, perhaps. In fact it owed more to the Essex suburbs with their conspicuous evidence of wealth and consumption - the gated drives and electric doors were identical, the 'protected by...' security signs read the same way. But things were more restrained and sober here. The houses gave nothing away. They looked inwards, protecting rather than advertising their inhabitants' affluence. Soon the lane became decidedly rural as it passed the conjoined bowling, football and cricket clubs, and I turned west again onto the appropriately named Games Lane. This led me onto the fringe of Monkton Hadley Common - a swathe of impressively dense and ancient woodland which soon enveloped me in its cool, green canopy. I never felt totally isolated of course - the gables of nearby villas often intruded on my vision - but it was pleasant to walk under the trees. Lost in the woods, it was a surprise to spot a small brick bridge at the top of a rise ahead - there was Pymmes Brook, trickling earnestly south. I'd encountered my target early - and I first had to follow the rise of the land beside it to the sluice at Jack's Lake where it unceremoniously dribbled over a concrete beam into the channel below. Here was the source of that sluggish, reeking ditch I'd come upon in the Lea Valley many times. Clear and cool, energetically determined to reach its destination, mercifully unaware of the fate that awaited it. I recorded the source in a picture for posterity, and set off south alongside the brook. The smooth, root-bound woodland floor sloped down into the water, making it possible to walk close beside the merry flow - a rare pleasure for a London waterway. Soon though I was directed down a suburban footpath and the woods gave way to housing: two long streets of decent sized homes marching down the valley with Pymmes Brook dribbling between them in the middle of a green central reservation. The brook's course was unmistakably marked by trees and tall grasses. At the mid-point of the avenue a small concrete bridge crossed the brook. I continued south, taking the western side as it offered a route closest to the brook once I got to the foot of the hill. Here the brook disappeared under a solid brick bridge, and I was forced to detour even further to the west, climbing a hill and turning south again knowing the brook was behind a line of semi-detached houses which arced across the hilltop. As I walked the curve of the aptly named Crescent Road and dodged the rubbish truck which was lazily but aromatically plying the street, I caught occasional glimpses into back gardens framed by tall trees and deep reed beds - tell-tale signs of the waterway. At the crossing of Margaret Road I saw a woman in a livid pink dress sorting through a bag of books left out on a low wall by the householder. As I approached she tapped me on the shoulder and said "let's find you something blokey - what about this?" as she thrust a novel at me. The cover was all rusted ironwork with the text securely riveted onto the front and the authors' name dwarfing the title. It didn't appeal and I guess my face gave away my lack of interest as she began to vigorously sort through the pile again. By now the householder was out with handy carrier bags if we wanted to take the books off her hands. "James Bond!" - a slim volume was jabbed at me and I instinctively accepted it. Satisfied that she'd found me something, she returned to combing through the books for more nuggets of interest. Unsure how to end this transaction I commented on the weather and what a good idea the passing on of unwanted books was, before uncomfortably shuffling on my way. I paused at the next junction to look over the parapet of a bridge discreetly nestled between garden sheds and garages. The brook lay deep beneath, wider and swifter now it had been joined by the Shirebourne whilst it wound behind the houses. Turning east onto the appropriately named Brookhill Road, I noted the ground rising again to the ridge on which Cockfosters sits - and if I continued this way, I'd find my way back to my starting point. I crossed the brook again here at an acute angle where it passed behind a small range of shuttered local shops. Beyond an untidy triangle of fly-tipped builder's rubble it disappeared once again under East Barnet - a settlement I confess to having never considered before. I turned onto the curiously named Cat Hill and noted the steady downhill progress - I was heading into the valley which the brook had carved over the millennia, still on the trail. From what I could see on reaching the bottom of the valley, East Barnet was a busy urban centre: a war memorial, a branch of Costa, a range of takeaways, and an automatic public convenience which was frustratingly out of service. I felt a little guilty for my initial impression based on a stretch of tired, closed computer repair shops. My route turned south here shortly before I reached the well-tended rose garden which fronted the stubby Celtic memorial cross, taking me onto Brookside. The waters of the brook reappeared, meandering along the bottom of a broad valley with green slopes rising on both sides. I walked on the grass, grateful for softer going underfoot, and tried to discern the curve of the brook at the foot of the valley in its green tangle. On the adjacent slope where the official path ran, a busy road rumbled along the ridge and the sun glinted from passing car windows. I was content with my off-road progress along this fine green swathe which finally opened out into Oak Hill Park - a broad and open plain in the midst of the suburban sprawl which had attracted the locals on this sunny morning. I found a vacant bench and sat beside the still clear and lively brook while I refreshed my water-bottle and rested my feet. I'd worried this walk might be just too suburban and uneventful, but the mix of geographical detective work and pleasant surroundings was just the tonic I needed today. Before leaving the park I detoured onto the west bank of the brook and walked along the rear veranda of a sizeable and dilapidated block of changing rooms in an attempt to use another of the London Borough of Barnet's public conveniences - but again, it was closed. Austerity bites in the oddest ways, I suppose. I trudged on, out of the park and into another well-tended grassy division between avenues of houses. East and West Walk flanked the brook as it made a slow southerly turn towards Brunswick Park - the next in a chain of green spaces which shadow the route of Pymmes Brook through Barnet. Here the trail is additionally dubbed Waterfall Walk, reflecting the regular man-made concrete dams which cross the brook, slowing its progress and restraining it from overwhelming its banks in times of flood - something the brook has regularly attempted over the centuries. The barriers made for a pleasant plashing sound as the water trickled lazily over each one. I clocked the temperature at 27 degrees, and despite my public convenience predicament, the sound of running water was a welcome psychosomatic coolant. A long stretch of old woodland soon enveloped the path again, the tree line to the west discreetly masking the transition from Brunswick Park into the austere circles of New Southgate Cemetery. Embedded deep in this woodland channel it was easy to imagine the trees forming an ancient forest - but they in fact run tightly along the path, with the back gardens of Barnet never more than a few feet away. The only tell-tale sign of humanity on this apparently lightly-used stretch was the reek of a sewer which is laid under the path and which seemed on the strength of it's detectable protests, to be tested to its limits just now. Strangely, the brook and its shadow path remained quietly and entirely disconnected from the suburbs which surround them. I savoured the cool after the strong sun in the open park. Rather unexpectedly at a sharp turn in the path a steel bridge deck appeared between the trees, with solid brick abutments swinging across the brook. Crossing a busy road under the bridge I found myself deposited at the foot of the great arches of Arnos Park Viaduct - one of the highlights of this walked I'd looked forward to, but hadn't expected to come across so suddenly. The northern extension of the Piccadilly Line in the 1930s posed challenges here - the Pymmes Brook carves a deep valley between the high ground of Finchley to the west and Southgate to the east - meaning that trains head north from the city in a deep tunnel before bursting into the open almost directly onto the ridge over the valley. 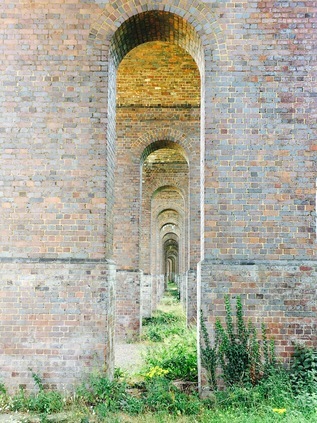 The result are the elegant thirty-four arches of the viaduct which swings over the edge of the park. Underneath all this engineering effort, the still tiny brook which has miraculously worn this deep valley is canalised to dog-leg under the arches and continue its course to the south-east. It was a rare pleasure to get this close to such a magnificent structure and to be able to wander alone under the arches with the trains rattling overhead. Between trains, the silence along with the coruscating brindle pattern of red and blue brick made for a strange ambience beneath the arches. In the middle of each span, a central channel of tall and narrow arches runs the length of the viaduct giving a truly dizzying receding perspective. 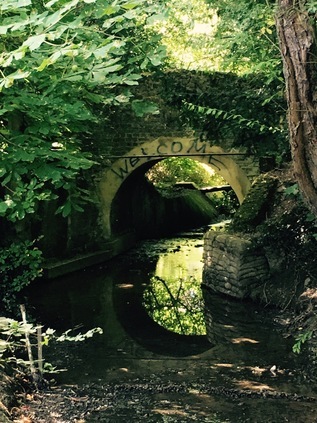 It was tempting to stride ahead, passing all the way along this secret inner path, until I realised that the deep concrete culvert abruptly divides the way, turning Pymmes Brook through two right-angles to continue a path through Arnos Park. I noticed that people didn't linger in the shadow of the viaduct and I had this stretch of path largely to myself. It was a shock then to move into the brighter part of the park and to find it teeming with families enjoying the sunshine and older folk contentedly occupying benches. I found my own bench and rested again, thinking about my lack of planning, and wondering quite how I could finish this walk? Reluctantly leaving the park I was aware I was closing in on an old foe - the North Circular. This road has haunted my recent walks: blocking my way across otherwise open land and twisting into complex geometries which make pedestrian navigation impossible. Today though I was encountering the A406 in a formative state. Despite being improved to a grade-separated motorway from Finchley to Palmers Green, as it turns an abrupt right-angle here it degrades into a classic 1930s arterial with side streets and traffic lights. Semi-detached houses line the route on both sides, as traffic howls along avoiding the very suburbs they carve through. As is often the case, the road didn't travel alone, its course following the shallow valley of the Bounds Green Brook which joined Pymmes Brook near the park exit, masked by trees. Delaying my time on the road for as long as I could, I slipped across Wilmer Way to inspect the low concrete parapet of the bridge taking the Brook under the road, emblazoned with a proud but long obsolete Southgate District Council monogram. By following the quiet suburbia of Ashridge Gardens I could echo the course of the waterway until the road turned sharply north along Broomfield Avenue. In the tight elbow of this junction, a gap in the fence let me see the brook trickling along. I slipped my camera between the palings of the fence before realising that nearby a family were playing in their back garden and were regarding my presence with some horror. I quickly slipped my camera away and smiled - in the hope that this would belie the idea that the wild-haired, red faced man at the fence was some sort of prowler. Not daring to look back just yet, I scurried off up the hill and over the railway bridge. Pausing to look along the tracks to the south the sky-scraping antenna of Alexandra Palace recalled an earlier walk and suddenly things slipped into context - this walk was the missing link between the Northern Heights, the regeneration zone of Woodberry Down and my obsession with the Lea Valley. North London, turning on a hinge in the A406 felt connected and legible. At last that vast sweep of suburbs - each with its village centre and run of local shops, each with a hinterland of semis and hidden waterways - was locked into place. Maybe it was the sun, or the heat playing with perception - but I realised that the web of streams which had oddly attracted me to these environs linked into a wider system which described the topography of the north and east, drawing me into further explorations. I'd often stumbled over an answer to the question "why walk those areas?" because I really didn't know. It was an exhilarating discovery that there really was a pattern - and that this walk did, after all, fit into it. I celebrated my moment of discovery in the only fitting way - by detouring into a nearby Morrisons to finally use the conveniences and to grab refreshments. It was an odd place for an epiphany - but a supermarket in Palmers Green is as good as anywhere. Once refreshed and underway again, I realised that I might have to adjust the scope of this walk - it was well over thirty degrees now and the sun showed no sign of moving from directly overhead. The next part of the trip would be challenging - but the walk was to yield a further special moment here, just beyond the impressive modernist hulk of Palmers Green Library. As I briefly turned into Green Lanes, the long stretch of road which runs deep into London's heart, I crossed the New River. Having stumbled on this quiet, stately presence in Barnet many years ago, found it circling the reservoirs at Woodberry Down and getting to explore its outfall in Islington it was rather special to look along the greenish, silent way and to imagine the long course to its source in Hertfordshire. Never meant to be navigable, the surface of the water shimmered tantalisingly close - just inches from the deck of the bridge. Resisting a strong temptation to turn aside and walk the river back to London, I returned to the crossroads, crossing the New River again as it continued north and east fringed by an inviting green towpath. Instead, I finally had to succumb to the North Circular, meeting it at a confusing confluence of suburban side-road and filling station, with traffic crazily queuing in zig-zags to leave and rejoin the carriageway. The heat radiated from the road and the metallic skins of passing cars rhythmically flashed the sun directly at me. I ducked my head and pressed on along the shared use path, the only pedestrian in sight. I wasn't sorry to reach a subway which permitted me to duck under the shuddering, overheated road to reach Chequers Way home to the vast Arla Foods dairy production site. The brook fringed the edge of the factory, and I was once again able to walk close beside it on Tile Kiln Lane. Considering the proximity of the orbital road and the factory, the walk here felt like a silent stroll along a narrow country lane. Beyond the low rise new-build flats at the end of the road I could head into a football field or pass the faded interpretation panels into the Tile Kiln Lane Open Space. I took the latter route - disappearing deep between high grasses and elderly trees, skirting the sports field and leading back to the main road at Great Cambridge Junction. The footpath was littered and cracked by roots - evidence of a slow return to nature. Bursting out of the greenery into a complex network of subways slung under the roundabout but above the road, I left the brook as it disappeared into a broad, concrete culvert to take a turn around the southern quadrants of the roundabout as I surfaced at the north eastern extremity on Kendal Parade. A fairly down-at-heel run of shops edged around the corner block. This was once an important stop on the highway, but was now passed at speed by all but a few - and they seemed to be lingering outside without purpose, soaking up heat and radiating boredom. North and south, the arrow-straight A10 headed from Cambridge into the city, a road usurped by new Motorways and better retail opportunities, while these local denizens watched and waited. The circus felt strangely trapped in time - a ringway-era relic which even the North Circular now bypassed by diving underneath. It wasn't a pleasant spot and I soon shuffled on swiftly in search of the course of the Pymmes Brook once again. It was here that I made my only real misjudgement in terms of today's route. Confused by what appeared to be access through the Millfield Arts Centre, I struck off along Silver Street at some pace. Soon after passing the gates of the sizeable property operated by Enfield Council I realised I was on the wrong track - and a desperate diversion into a small close of flats and houses gained nothing but curious and suspicious looks from the locals. As luck would have it, an elegantly dressed woman clip-clopped out of a nearby house in a businesslike fashion towards a very expensive car which diverted their attention briefly. They mentally checked her - plain clothes police? Insurance? Doctor? Meanwhile, the brook sat behind a locked gate opened only by a residents key. I had to retrace my steps to the North Circular. Almost as soon as I started walking the treacherously cracked path at the edge of the road the warning that no pedestrians could proceed beyond the next quarter-mile was signalled by a huge green sign. I approached a lay-by where a Polish registered truck was parked, its owner sitting out on the grass in the sunshine. Suddenly a grinding and gasping sound announced the passing of a Jaguar saloon with smoke gushing from under the bonnet. He scuttered to a halt in the lay-by just a little shy of the truck and immediately began punching buttons on his 'phone. The trucker dashed around waving his arms and warning him not to open the bonnet. I passed by watching the strange scene and wondering just how I was going to escape from the road myself? Across the six lanes of traffic, the North Middlesex Hospital glowered over Edmonton - a grim and formless building. Unexpectedly, I found Tanners End Lane - a stopped up road severed from the A406 by solid bollards, and which would take me back to the Brook. In the event, I found myself almost where I'd have been had I pursued my original course on Silver Street, finding a paved slope leading down to a walkway deep between jagged, modern brick housing blocks. It was cool and shaded down here, the brook in its wide concrete channel. Up ahead, the channel divided into two, separated by a central beam which I recalled seeing at the outflow into the River Lea - though I've never established why this was done? There was some way to go for Pymmes Brook but much of it would be underground from here. The culvert loomed, broken tree-limbs trapped across the entrance. I climbed the ramp to Silver Street and into Pymmes Park - named from the brook which barely skirted its edge. I rested a while here, the sun still bearing down on the parched park. I could press on into Tottenham and try to delve for the brook under industrial sites and Ikea carparks, or I could call it quits at Fore Street - knowing the brook was bubbling under the junction on route to the Lea. Eventually I opted for the latter. It left a section of the route unwalked - but it was a troublesome and contested section which needed my wits and enough energy to manage the frustration of blocked routes and wasted turns. I had neither about me. The closest I could get to the route without walking was a bus along Fore Street and into the city, so I passed by Silver Street station and emerged at the crossroads where the North Circular emerged from the brief tunnel to make its arc over the Lea Valley. Edmonton was clinging to life via pound shops and small branches of national multiples. But it was alive still, and pushing my way to the bus stop wasn't easy in the Saturday afternoon crowds. In some ways, Pymmes Brook defeated me today - I almost made the full length of the surprisingly resilient little stream, only to be thwarted by the heat on what I almost considered home turf. 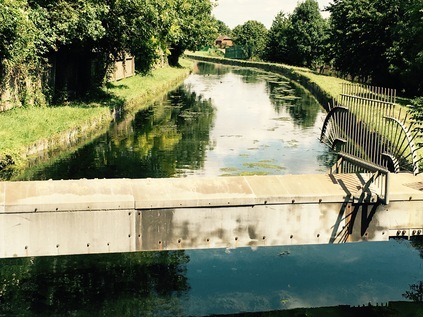 As the 149 bus trundled slowly towards Liverpool Street, I thought of the confluence with the Lea spied on other walks, a reeking culvert swinging alongside the river and finally joining it at Tottenham Hale. I thought of the tributaries I'd happened on - the Salmon and the Bounds Green Brook - and how they too deserved the honour of a walk. What had seemed to be somewhat inert amble across North London had ended up being the key that unlocked the territory I'd been unwittingly marking out for almost a year. 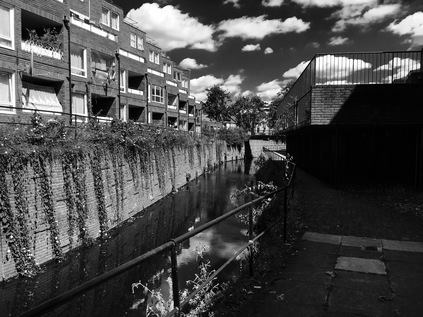 Pymmes Brook itself is an unsettled stream - variously known throughout the last millennium as Medeseye, Millicents Brook and Bell Brook, its changing name and sometimes shifting path to the Lea appear to have confounded plenty before I arrived. London still has so many secrets to give up. You can find a gallery of images from the walk here. In an odd coincidence, John Rogers walked the brook in the reverse direction for his series of excellent Youtube videos. You can see his progress at The River of No Return.